It's A Great Blog After All – Everything Disney. As told by an aspiring Disney Princess. I have always classified myself as a dreamer – someone who wholeheartedly believes in magic, fantasy and the impossible. Walt Disney was a dreamer – he had countless visions, fantastic and what could be considered absurd ideas. Walt’s journey was not an easy one as he faced many hardships, but he never lost sight of his dreams. At age 22, Walt was forced to declare bankruptcy on his studio. However, that did not stop him. It took Walt years of hard work, devotion and dreaming before things started turning around for him, thanks to the help of a very special mouse. The rest is history. Walt possessed the courage to follow his dreams, and he took countless risks. Would Walt have become the pioneer of cartoon films and creator of Disneyland if he had not taken chances? My guess would be no. He went after what he believed in, what he dreamed in, and did what he believed he had to do. Now, what do Walt and I have in common? We are both dreamers, and apparently risk takers. Walt has always inspired me in many ways, but his journey has truly helped inspire my decision to go after my dreams – the dreams I have had since I was a little girl. With that being said, I am proud to say I have accepted a position with the Walt Disney Company, booked a one way flight to Orlando, and I am not looking back. Anybody that knows me knows of my deep passion for Disney. Well, some may call it an obsession, but I prefer passion. 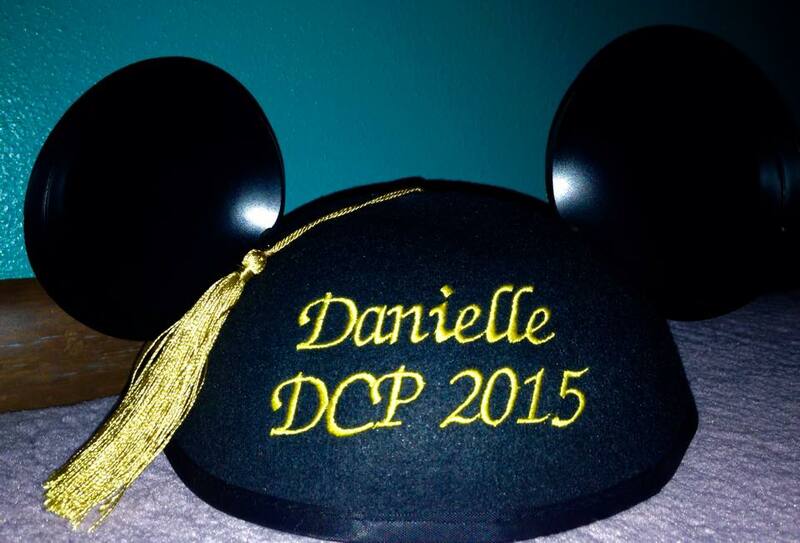 I embarked on a life changing journey almost two years ago – I began my journey on the Disney College Program. I use the words life changing because that is exactly what the program did for me, it changed my life. It was not until my time as a Cast Member that I realized the Walt Disney Company was the company for me. The Walt Disney Company was a company I could see myself pursuing a career in, a company that meant so much to me growing up, a company I truly loved. I made the difficult decision to return home after my program ended, however, I knew it was the smartest decision for me at the time. In return, I have learned more about myself the past year and a half than I could have ever imagined or hoped for. Even though I have grown, my dreams of working for my favorite company have not changed – they have only grown stronger. I’ve never been one for “what if’s,” which made my decision to pursue my dream career at Disney a no brainer. I never want to look back on my life and wonder what could have happened if I built up the courage to follow my dreams. What would have happened if Walt decided to give up after he went bankrupt? Continuing to follow his dreams, no matter how big, after that was a risk, but he chose to do so. I know I am taking a risk, but I know it’s a risk I will never regret taking. Is packing my bags, quitting a full-time job and moving to Florida to pursue a dream a smart decision? Absolutely not. In fact, it’s absolutely absurd. I know that. However, I know in my heart that this is the right path for me. This very well could be a step towards making my crazy, huge dream come true. I’m sure people looked at Walt and thought some of his decisions were absurd, just like I’m sure people will do the same to mine. Walt never gave up, and I’m not giving up either. I’m a dreamer, and I’m hoping to find my “Mickey Mouse” soon. I firmly believe my upcoming role with Park Operations is setting me on the path to achieve my ultimate goals. I truly could not be happier to be moving back to the most magical place on earth where I will be creating magic and impacting lives daily. Always remember to keep dreaming, and never lose sight of your dreams. And the best part is, you’ll never run out of wishes. They’re shining deep down inside of you. For 14 years, Disney goers of all ages have watched the sky light up after long, yet exciting days at the Magic Kingdom with a magical gathering of Disney Dreams hosted by Jiminy Cricket. To many, Wishes was more than just a fireworks show, it was a constant reminder that all of our wishes and dreams can come true if we believe. Wishes, in a way, really captured the spirit and essence of Walt Disney. Walt said, “all of our dreams can come true if we have the courage to pursue them.” Well, isn’t that what the Wishes firework show is all about? Taking a chance, pursuing our dreams, and watching them come true? This, my friends, is one of the reasons why Wishes truly touched me, and why it also touched so many people, especially fellow cast members. I will never forget the first time I watched Wishes with my roommates my first time in Magic Kingdom as a cast member. Something happened to me that night, and I was overcome with emotion. Working at Disney was a dream of mine ever since I was little, and in that moment, I had realized all that I had accomplished, and that my one wish was finally coming true because I believed. Listening to the wishes of Cinderella, Snow White, Ariel, Peter Pan, Pinocchio and Aladdin, I suddenly realized that these characters I had grown up watching over and over again were the ones who taught me to never stop dreaming or wishing. In that moment, I found where I was meant to be. I must admit, working at the most magical place on Earth was not always glamorous. Wishes was always a reminder to me why I was there, and the magic I was creating. Every single night at Magic Kingdom, people of all ages would gather closely together on crowded streets waiting for the lights to dim, and the music of Wishes to begin. Every single night, little girls dressed in princess dresses with tired eyes would watch in awe as Tinkerbell floated across the sky, and fireworks filled the night sky. Standing in the middle of Main Street, I would look around and watch people’s reactions to a show that somehow meant much more to me than just a show, and everything made sense. Thanks to Wishes, I will never stop dreaming, never stop believing, and never stop wishing. Wishes has given me memories that will last a lifetime with some of my closest friends, from the very first time I watched it in 2012 to my last in 2017. Thank you Wishes, for always reminding me on my toughest days to keep believing. I will never forget what just a little wishing can do. Let me begin by saying that I absolutely adored the new live-action Beauty and the Beast. Shocking, I know. Disney’s live-action remake of my favorite fairytale was true as it can be to the original, which is one of the reasons I loved it so much. It is extremely faithful to the original, which in my mind is pure cinematic perfection. Why change something that is beloved by so many? The answer is, you don’t. If it’s not baroque, don’t fix it. At this point, I feel as if I could write a novel just on my thoughts from this wonderful movie that has consumed my brain the past 48 hours. However, my plan is to keep this as brief as possible and talk about what I think are the highlights of this beautiful rendition. Emma Watson truly was able to recreate Belle in the most heroic way. Belle, in my mind, has always been adventurous and fearless, but Emma was able to portray her in a new light. The film touches more upon her character and what makes her an outsider in her small village. Belle is progressive, and she goes against the gender standards for women in her small-minded village. Shortly into the film you see women hand washing their clothes. Belle, however, has a better idea. Emma Watson told Entertainment Weekly, “I was like, ‘Well, there was never very much information or detail at the beginning of the story as to why Belle didn’t fit in, other than she liked books.’ Also, what is she doing with her time? So we created a backstory for her, which was that she had invented a kind of washing machine so that, instead of doing laundry, she could sit and use that time to read. We made Belle an inventor.” I LOVED this addition to Belle’s character. We also see much more of the relationship between Belle and Beast, and just how much they have in common (love for books and not to mention, slightly stubborn personalities…) Belle and Beast both suffered from heartbreak and loneliness, bringing them together in a touching and romantic way. Belle was looked at as a funny girl in her village, and Beast was feared among the servants in the castle. Both felt like outsiders, something that they truly were able to bond over. I loved how all of my favorite characters were given backstories. We learned what happened to Belle’s mother and why Maurice doesn’t talk about it, we learned about the Beast and his life before the curse, and we learned about Gaston and his days in the war. All of these backstories gave so much depth to the characters, something that was not depicted in the original. It made me feel compassion towards the Beast, love towards Maurice and even MORE hate towards Gaston. I must admit, I have always been a fan of Gaston, but I found him much harder to love after seeing this extremely dark side of him. They also showed the strong love and sense of loyalty between a father and daughter. What’s dinner without a little music? Well, in this case, what’s a movie without a little music? ALL OF THE ORIGINAL SONGS (AND EVEN THE SCORE) ARE INCLUDED. THANK YOU DISNEY GODS. Actually, thank you Alan Menken, musical genius. The original songs sound great (special thanks to the very talented Luke Evans,) and there are even a few new songs that really fit in the film nicely, especially with the backstory additions. My favorite new song has to be “Evermore,” which is sung by the Beast after he lets Belle go. It’s an absolutely heartbreaking song that is sung beautifully. The music does not disappoint. No Beauty and the Beast review is complete without mention of the classic ballroom dance scene. This scene brought me to tears. It. Was. FLAWLESS. The way that Belle’s dress followed her as she twirled around the ballroom, the way Beast lifts Belle with the twinkling lights in the background… How can you NOT feel all the feels? This is by far my FAVORITE scene of the movie. Good job Disney, good job. This movie completely blew me away. It was everything I had dreamed it would be, and so much more. I have seriously had the hardest time putting into words my feelings for this movie besides it simply makes my heart feel happy. Having seen the original more times than I can even possibly imagine (seriously, this has been a favorite of mine since I was one,) this live-action was a perfect retelling of a story that teaches you that true beauty is found within. Ever since I was a little girl, “Beauty and the Beast” has always been one of my very favorite Disney movies. I had the privilege growing up to visit Walt Disney World often, which may help explain my passion. In fact, there is a home video of me about a year old at the “Beauty and the Beast” stage show at then MGM Studios and I could not look happier. Surely at that age I was mesmerized by the singing and dancing enchanted objects, but little did I know just how much this story would someday mean to me. The way the film starts telling the story with beautiful stained glass windows. The song “Belle.” It’s almost a six minute opening number, but it’s perfect. It tells so much about both Belle and Gaston’s personality, along with the town. That Belle is the only one in the village wearing the color blue. It solidifies the fact that she feels like an outcast in her town, although they all think she’s beautiful. She later comes to find the Beast, who also is found wearing blue. That Gaston is the only one in the village wearing a vibrant red. That also solidifies the fact that he is the villain, and quite evil despite his charm. That Belle always has a piece of hair in her face, showing that she has imperfections regardless of her exterior beauty. When Belle sings that she wants adventure in the great wide somewhere. This is such a powerful line that Belle sings that truly showcases her unconventional personality. Phillipe. Isn’t he just the cutest horse? Cogsworth’s witty and pompous personality. All of the food during the “Be Our Guest” scene! Beef ragout, cheese souffle, pie and pudding en flambe! Who wouldn’t want to eat that? The enchanted rose. It’s just so beautiful. Mrs. Potts’ compassionate and warm personality. In a way, she comforts Belle the most and gives her a motherly figure. When the Beast saves Belle from the wolves. Talk about heroic. The entire “Something There” scene. This is one of the first times we see interest between Belle and Beast, and it is one of my favorite songs. We start to see the softer side of Beast, all thanks to Belle. The breathtakingly beautiful ballroom. This is definitely the film’s most memorable and iconic scene, and for good reason. The way Beast twirls Belle around that ballroom is every girl’s dream. When Beast lets Belle go because he loves her. This scene really shows how much Belle has changed Beast, and how much he truly cares for her. It’s heartbreaking. The “Mob Song.” I must admit even though he is evil, there is just something about Gaston that I love. He’s always so focused on winning, no matter what it is, which could be seen as somewhat admirable. This song is such a powerful song leading up to the end dual between Gaston and Beast. When Beast sees Belle come back to help him during his dual with Gaston. You can see his will to live rush back into him, and he suddenly has something to fight for. The message of this movie that true beauty comes from within. We must learn to look past what is on the outside because it is truly what is on the inside that matters. Being compassionate, like Belle when she takes her father’s place in the castle, and selfless, like Beast when he agrees to let Belle go see her father, is representations of true inner beauty. How this movie changed my life. “Beauty and the Beast” has taught me it’s okay to be different. Belle, along with her father, was seen as an outcast in her town. The Beast was also different. Standing out is not necessarily a bad thing, neither is being different. Belle was also always able to look past appearance. Just look at Gaston, the most handsome guy in town. Every girl in town went crazy over Gaston, except for Belle. That was because she had the ability to look past his appearance to see his true self. She fell in love with a Beast, not because of his appearance, but because of what was inside. A sketch of Walt and Mickey Mouse as Steamboat Willie is shown on the castle in black and white to remind us just exactly where this all started, with a man, a dream and a mouse. The simplicity of it with the lyrics “let your dreams come true tonight” always reminded me of Walt’s struggles and how hard he worked to achieve his dreams. To be standing in front of Cinderella’s castle and to look around and see everything that has come from a man and a dream always struck a cord with me. The first time I ever saw “Celebrate the Magic” was after I had my official Cast Member “initiation” through Traditions. Being in Magic Kingdom for the first time as a Cast Member is a feeling I will never forget, and watching this nighttime show helped me realize for the first time all of the magic I was going to be creating. It was one of the moments that really hit me that my dreams of becoming a Cast Member were coming true. The show is simple, yet meaningful to many who watch. To the guests who visit once or twice a year, it’s a mashup of their favorite Disney movies and beloved characters. However, to those who make magic as Cast Members, this show means a little more. As a Cast Member, I quite literally celebrated (and created) the magic every day. So, thank you “Celebrate the Magic” for filling my heart with so much joy and overwhelming emotion during my six months as a Cast Member. The song, the memories and the magic will always stick with me. One last thing. Walt, I promise I will never lose sight of one thing, that it was all started by a mouse. It’s officially official… the live-action retelling of the Disney classic Beauty and the Beast is coming to theaters March 17, 2017 (or approximately 179 days but who is counting?) The official United States teaser trailer was released just a few months ago and has already broken numerous records. It pulled in more views during its first day than any other film. According to Disney, it had reached a whopping 91.8 million views duri ng the first 24 hours, surpassing Star Wars: The Force Awakens’ teaser. But, you may ask, what is all the hype about and what is causing this teaser trailer just over a minute long to break records? That, my friends, is the magic of Disney. Of course being the tremendous fan that I am, I have watched this trailer over and over again and I could not be more excited for this film. You may ask just how much can a minute and a half long trailer really tell you about a movie but in this case, it tells us so much about this beloved tale. Pause. How magnificent is this castle? It’s dark and eery on the outside but still elegant and somewhat romantic. The first few seconds of the trailer where the exterior of the castle is shown reminds me so much of the scene when Papa and Phillipe ride up to the castle for the first time after getting lost in the woods. It was dark and gloomy and cold, which is exactly what is displayed in the first few seconds of the trailer. Next, the ballroom. The ballroom is exactly what I imagined it would look like in real life. Of course I have seen the REAL DEAL (and even dined in it) at Be Our Guest Restaurant, but this trailer gets everything right from the chandeliers to the golden hues to the piano. The inside of the castle looks completely abandoned. I personally like how they show the candles melting to show that time has passed. YES! They just may have fixed a MAJOR error with the 1991 classic film and that is the age of Adam when he was transformed into a hideous (but cuddly) beast and we see this in the portrait of Adam and his parents. Adam in the portrait is clearly a young boy which makes much more sense in the grand scheme of things. Thank goodness. Also, the way that the Beast rips the portrait is yet another clue that this remake will be true to the 1991 film. The voices of all three of these characters are perfect. You can already tell that the personalities of these characters are going to similar to the previous film. You can tell in just a few words that Cogsworth has a serious demeanor and a strict attitude. You can also tell that Luminere is quite the opposite of Cogsworth with a charismatic and optimistic personality asking “what if she is the one?” Obviously I have no complaints about Belle. Needless to say, this movie is going to be phenomenal and I cannot wait to see the full trailer that is being released with the 25th Anniversary Edition of the film on September 20th. I must admit, I am curious to see how they are going to do all of the enchanted objects but I trust Disney. Check out this side by side of the 1991 movie and the 2017 trailer to see all of these similarities for yourself! From Tangled to Moana: Is Disney Having a Second Renaissance? It’s A Great Blog After All has been featured on MoviePilot. Does this author sound familiar? Hello Disney Cousins! Whoa… I’m blogging. Well, sort of. I am VLOGGING (video blogging… who knew?) I was tagged by Michelle, one of my roommates from the Disney College Program, to do the Disney College Program Tag and I thought why not give this whole video blogging thing a go. Visit Danielle Ogozaly's profile on Pinterest.